We went to Wexford, to my parents, on Christmas day which was lovely as my sister and brother were home too. I love it when everyone is around. But glad to get back to normal life now, and my knitting! Merry Christmas one and all. Hope everyone has a lovely holiday! What a rush this Christmas has been. Today I was still finishing off presents. And I went to the shop to get more wrapping paper, as I'd run out, and some supplies to bake cookies but forgot a vital ingredient - butter. Although it was never going to be a great day. Smem decided she didn't want to sleep last night around 1am. I hadn't gotten to sleep at that stage and didn't get her back into to bed until after 2am so I was a bit tired this morning! Looks like some parts of Ireland with have a white Christmas this year. Not here though I'd say. The weather has been unusually cold here the last few days and our road was like glass this morning. Myself and Smem had a very treacherous walk to the shop this morning. But enough of the talking, some photos. I had wanted to post photos during the week but my camera had run out of battery and I kept forgetting to charge it. I took a little break from knitting this week (I'm not happy with the pattern I'm writing at the moment) to make some little plushies. I sketched a little pattern for a bug and cut the pattern from that. They're about 6-7inches tall and are super quick to make. And a little christmas angel bug that I absolutely adore! My only concern would be that I've inadvertently copied someone else. I read so many blogs and love what so many other designers do. But hopefully I haven't. Might make some to sell in my Etsy shop. I knitted a horrible misshapen stocking for Smem last year so I thought I'd better make her a nicer one this year. And as I've been doing so much knitting recently I decided to take a break from that and make her a quilted stocking. I think it turned out quite cute so I though I'd share the pattern. Materials: cream cotton for stocking, wadding, cream fleece for inside of sock, some green gingham (or other fabric of your choice) for angel's dress and top of sock, gold fabric for the wings, peachy felt for the head, some 4-ply yarn for the hair, embroidery floss in gold, pink and blue, sewing needle and white thread, some scraps of trims and beads for embellishment, some fabric stars to sew on. 1. First off print off the pattern pieces. I haven't learnt yet how to attach files to my blog so I've just uploaded jpgs of the pattern pieces. Print them out to cover an A4 page each. Cut out all the parts, and join the top and lower halves of the stocking together. A simple little rib pattern for an adult sized hat. It has a small twist in it to add a bit of interest. I've added it to the Ravelry database, and hopefully the link below works for non-Ravelry member. Petite Purls Pattern is Online!! Woo Hoo! So exciting to see my pattern published in a real magazine. Can't wait to see what other people's projects look like on Ravelry (or if anyone knits it!). 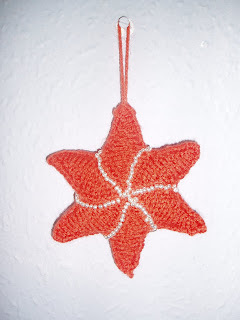 Another project from last year - the knitted star, which seems to be a reasonable hit on Ravlery. A picture heavy post today, but its all for good reason. I made this cute little wreath for my front door and thought I'd share how I made as it was really simple and really quick. You'd whip it up in a few hours. You'll need fabric in red, green and white (or whatever combination you choose. Different golds would be nice, or blue and white...... or any number of possibilities! ); some polyester stuffing; some thin white ribbon and some wider green ribbon; sewing needle and thread. Cut a length of fabric in each colour 3.5 inches by 42 inches. You may need to sew pieces together to get the length. I used fat quarters of red and green so I cut two strips from the long side and sewed them together. Fold each strip in half lengthways and sew all along the edge, about 1/4 inch from the edge. Turn all the strips right side out and stuff well. A pencil or knitting needle is a handy tool to help with this. My Living Room has been invaded! By the Christmas card-making fairy! And here is the final card. Kinda simple, but it needs to be as I have to make around 70 or so. What do you blog about when you're working on projects that you can't blog about? Tough, I know. So here's a little sketch I did the other day while drawing with Smem. I couldn't finish colouring it in as my markers are very old and not very good, but Smem did her best to try help out. Love toadstools. Think this could make a nice applique for a quilt? Since Saturday night I've been knitting like a mad woman to get two of these balaclavas done. DH is out to dinner tonight with two friends who had babies during the summer and we hadn't given them any gift yet. This pattern is from Drops Design - Bonnet in rib in Alpaca. It was easier to follow than some other Drops patterns I've knit. And was easy to knit and, more importantly, quick to knit! I knit the 6-9 month size but I still managed to squeeze it onto Smem's head for a photo! And I think Smem may think she's in a nativity play. If I thought I was in a bad mood yesterday, I knew nothing. Ended up in tears this morning on the couch. This motherhood lark is hard. Think I just need a break. Or a sleep in!! But the lovely messages have spurred me on (that and some biscuit cake that my parents gave me yesterday. yummy!). So the knitting has started, although it will be while before there will be any book. Maybe just an ebook to start with. But there's plenty of time to research that. But it does mean there will not be a new pattern in the shop this month, so no giveaway. There will however be a free pattern on the PetitePurls website at some stage though. And I'll definitely let everyone know when that comes out. Whoop whoop! Any day now. Okay, so bad blogging again this week. Just can't seem to get any routine. I was out Tuesday night for our knitting group and then out Wednesday for choir practice (which has ramped up in the run-up to Christmas!). Wasn't going to blog tonight as I've no photos to show. But I've been thinking about job related stuff and needed to vent/ask for advice. Being a stay-at-home mam is great in the greater scheme of things. But I do find it a bit hard. Its just me and Smem most days, even at the weekend as DH usually has stuff on at the weekends or disappears into his office to write and record music. So just me and Smem can be a bit much. I love her to bits but she's very strong-willed and its hard to keep fighting with her all the time.